Virgilio by Diptyque is now one of their boutique exclusive fragrances (together with Eau d'Elide), relegated to limited distribution after a couple of years of being completely unavailable. The reason, I presume, is its utterly non-perfumy strangeness. You see, Virgilio smells like a big bouquet of basil, garnished with thyme or maybe wild oregano, and in any case have such a realistic chopped herbs vibes many people want it in their salad more than on skin. Lovers of green herbal fragrances feel differently, of course, and with a good reason. Like many earlier Diptyque perfumes. Virgilio is wonderfully distinct and unique. The opening notes of Virgilio are green and greener. They feel like picking herbs and crushing them in your hands, getting the aroma and a bit of their juice under your nails. If you keep walking beyond the gate of the kitchen garden you reach an open hay field, and you'll smell the fresh hay and also some of the small wild flowers growing on the side of the road leading up the hill, the terrain is uneven and ancient trees grow, their crooked limbs reaching towards the summer sky. Diptyque's Virgilio goes from green and fresh to woody and warm. The basil doesn't completely go away, though, and you can smell it if you get your nose close enough to the skin. I'm guessing that Virgilio is considered a masculine, but anyone who enjoys green herbal notes should at least sample it and see what the fuss is about. Longevity is better than one would expect, remaining detectable for at least 6 hours on my skin (I do spray with abandon) and smelling wonderful in the summer heat. 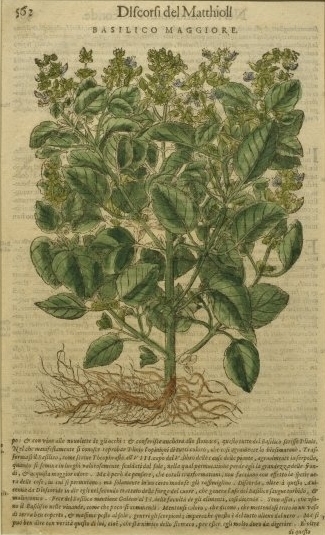 Image: Basil, a botanical plate from the 'Discorsi' by Pietro Andrea Mattioli. I have to admit, I'm kind of intrigued. I think this might be a nice, unconventional scent for summer. One of my favorites from Diptique (besides L' Eau Trois), I find the green herbal notes addicting! Especially lovely layered over a vetiver. The vetiver harmonises the herbal bitters very well, and adds a little to the longevity.